It is an expendable part of the sword whose prime purpose it is to be worn down over time. Whether or not the peen block should be included in the layout I leave to you but this basic assumption is incorrect. The peen block serves a function other than as a sacrificial structure, it concentrates the force of a pommel strike on a smaller area. We have a number of examples from historical artwork and even fechtbucher that show peen blocks that were deliberately made sharp to enhance this effect. A definite proof of my hypothesis must wait untill an actual drawing is unearthed in some archive. I think the chanse of this is very slim, since sword plans most likely would have been made on perishable materials, without any intention of saving them to posterity. It is not like the plans of a cathedral that must survive generations of builders. That would be an exciting find but like you I suspect the odds are against it. There is another possibility however, the writings of fencing masters that were intended to survive generations and in fact have. Most sword enthusiasts are aware of basic concepts like the strong and weak of a blade but many fencing masters divided the blade and even the whole sword into several or in some cases many more numbered pieces. Quite a few years ago I noticed that some of the suggested divisions I am aware of corresponded closely to the actual proportions of surviving swords that otherwise were generally in keeping with the context of a particular ancient master. I don't know circles and angles from noth'n but it's easy enough to see with a measuring tape. Weapon configurations matter, while a practiced swordsman will be able to successfully wield weapons with a wide range of attributes he'll be able to do his best work with pieces that have specific features, proportions and measurements. If the peen block was created for this one and only use, why not simply put on every sword a pommel that is of functional shape, like on some Castillon or Venetian? I guess the peen block answered in fact to various needs. The maker to maybe easily dismount the sword for a repairing work, the owner/fighter for some effective pommel strikes - and aesthetics, of course. I'm open to the idea that a peen block can make a sword a little easier to take down and re-assemble because that's self-evident but here's the thing... we know older blades were used on newer hilts but I've not seen the opposite. A Sword's blade can potentially wear out very quickly with combat use while the hilt remains perfectly serviceable but we don't have many examples of old hilts mounted with new blades which is what you'd expect if the peen block was there to serve a sacrificial role so the pommel could be preserved. Instead what we see is the styling of hilts getting updated at least as often as every few decades. Come to think of it where do we get the term "peen block" from anyway? It sounds modern and I've not seen it used in any historical source I can recall. As for why a "peen block" may have been used instead of always making a functionally shaped pommel I'd argue that all pommels are functionally shaped. Smash somebody in the face with a simple type G disk pommel and it's going to have the desired effect. Some people seem to have preferred a little spike on their pommel, others didn't. Since we know sword components were mass produced it was probably simply more economic to add a peen block to the sword of somebody who wanted a spike on his pommel than to stock two versions of essentially the same pommel. I have been guilty of breaking the first rule of internet forum discussions: never neglect to mention a favourite aspect of the topic at hand, even if it is not the main focus of the discussion at hand. Of course the tingomabob at the top of the pommel is perfectly suited to deal extra damage. I have myself rejoiced in describing this important tactical feature many times in the past! However, it still remains a thing that is sometimes added or not added to the overall shape of the sword. During some periods it is more or less completely absent, during other periods it is nearly always part of the sword even if it is a separate litre nut that is added, almost as if on an afterthought. You will find sword families that nearly all lack this little crowning pearl of a thing, and other sword families where nearly all members are nut jobs. If you ever get to make a sword yourself, you will experience how the rivet button does make peening the tang easier. But it was obviously not so important that it was always added. And it takes extra time to make one after all. Likewise it seems that a pommel is quite capable of caving in skulls even without this extra extension, otherwise you would expect it to be a more common feature, perhaps. Peen block is a modern term, I should guess. So is Skull crusher. We will have to look for terms in latin or medieval french or german to learn what it was called back in the day. I expect there were several terms used to describe it. The nomenclature of swords tends to be complex and confusing. If you get to take a closer look at dismounted rapiers (both hilts and blades) and unmounted rapier blades you will appreciate the role of the rivet button (and yes, this is the accepted term for the thingamabob in this context) as a facilitating detail for the cutler. The rivet button also becomes almost a standard feature in this period (even if still commonly a separate little piece), when blades and hilts increasingly were separate products and when you could expect the mounting and dismounting to have been a more common procedure in the working life of the weapon. Or perhaps the caving in of skulls and smashing of faces also became really, *really* popular in this time period? Mike you say that you are open to the idea that the thingamabob at the top of the pommel makes the life of the sword cutler a little easier (and also that this aspect is self evident) but you keep pressing the tactical importance of the thingamabob as its most important aspect. To me it seems that it is a personal favourite thing for you and that you prefer to see functional explanations over practical ones. But I may be mistaken. In my view, many, if not most aspect of swords fulfil many roles at the same time. I did let myself down when I suggested otherwise in this case. It is just that my experience as wordsmith sometimes takes control of the mind office. Especially when I discuss swords from a sword makers perspective. In the heat of the moment I sometimes forget to put forward important tactical roles of various parts of the sword. If you can forgive my misstep in neglecting to point to the skull crushing nature of the rivet button (or pommelthingomabob), perhaps we can agree that it is not a natural integral part of the design of all swords? That it can be added or not added and therefore lies outside the basic form of the sword? I hope that that much comes across in my post, even if it was woefully incomplete and sloppy in how I presented the concept? When you look at originals of this type you can see how the tang button/rivet block/pommel nut/skull crusher/nose bleeder is sometimes integral to the pommel and sometimes shaped separately. Perhaps the integral ones are examples that were never dismounted and the ones with separate ones are swords than had the original thingamabob filed down and then replaced with a new tactical skull crushing feature? Yes, any blade can quickly acquire significant damage from combat use and need reshaping or replacing. Do rapiers conform to your theory of geometric layout? It has very little to do with me or my personal tastes, it's simply a matter of how the weapons were approached by their original makers and users. The images below are from the 14th and 15th c. respectively and show radical implementations of this feature, the intended purpose is clear enough. Secondly, you should learn that there is nothing about the sword that has been invented without reason and that a fencer should make use of the point, both edges, the hilt and the pommel. Each of these has its own special methods in the art of fencing. How to practice this, you will see and hear later. In my view, many, if not most aspect of swords fulfil many roles at the same time. From these divisions of the sword arise the proper full divisions, which are very useful in combat, namely that the sword is commonly further divided and distinguished into four parts, as may be seen in the previous image. The first is called the grip or haft; it includes the pommel and cross, and is useful for running in, wrestling, grappling, casting, and other work. The second is the strong as I have said, useful for slicing, winding, pressing, and other things that are executed from the strong. The third part is the midpart; it is taken equally from the forte and foible around the middle part, and pertains to various work that may be used according to the opportunity. The fourth is the weak, appropriate for changing through, flicking, slinging, and such things that are executed at a distance, of which you will have plenty of examples later. With rapiers we have a situation where many today are not mounted with their original blades. I also have a suspicion that hilts may more often have been designed as a separate thing from the blade during this period. -Less a complete wholeness of things as was the case with high medieval swords. However, I do find rapiers conforming to geometric structures in many cases. Again, it seems to be Italian weapons that do not as readily follow this rule. I post again an image showing two rapiers following similar geometries that was posted by me earlier on in this thread. I have several more that are as of yet unpublished (hoping to do so in the future). The geometry of rapier(-hilts) tend to be more complex tun that of simple cruciform swords. There are more parts involved... Therefore the geometry is by itself not as convincing. 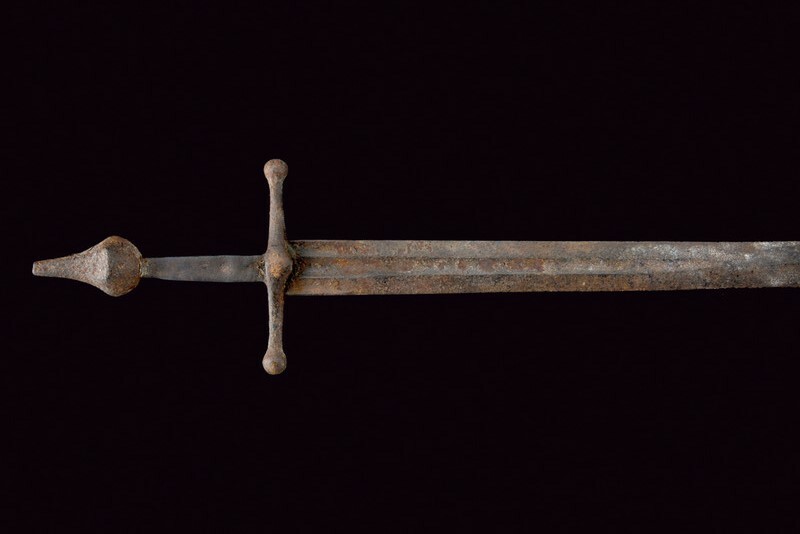 However, if you look closer you will see that it is the same strategies used for medieval cruciform swords, but repeated to define the greater number of elements. The one written support I have for the use of geometry in the design of swords come from the year 1633 in the play "The Weeding of Covent Garden" by Richard Brome, where "the Father" tells "his Son" to get himself a proper sword (instead of the sorry excuse of a weapon he now as), saying: "buy you a good one, one with the mathematical hilt, as they term it." It is time to show the three test swords, me thinks. But first a post that discuss some points that have been brought up on this thread a few times by different contributors. The geometry of the three swords will be posted in separate posts below. Or rather, the geometry of two of them, since the third was not based on any geometry or modular principles. I am devious that way. I intend to discuss this in coming articles, where I present various patterns within the patterns and critique my own results. It is impossible to do this on an online forum, unfortunately, since a full publication of the material is needed to provide good reference. I will definitely be interested to see more in-depth study of this topic. Have you given any thought yet as to how the material will be published, and in particular how it might be made reasonably accessible to the non-academic community? Possibly publishing through open-access journals, or on Academia.edu? The exhibit catalogue has been well worth the price, but it was not easy to get from overseas... in my case, the museum was gracious enough to still send me the catalogue after an un-disclosed bank fee meant they did not receive their full payment. Yes, to some extent or another that seems to have been the case pre-17th c. but the trend gets stronger as you move forward in time. The funny thing is there was still a sense of scaling the weapon to the wielder up until very recently. For instance a fencer's height would suggest a particular blade length and there was an ideal handle length based on the fencer's individual grip. This is probably a continuation of an ancient tradition as it appears to fit many Medieval swords, too. I'd believe that. It's possible to divide the majority of Western swords into two big branches, double edged and single edged. At the risk of upsetting some enthusiasts we could call the first "swords" and the second "sabers." The small sword is at the very far end of the timeline and may not have a cutting edge at all but deep down in its core it's a sword, a descendant of the gaddhjalt, as such there's a cruciform sword in there somewhere... there's just a couple centuries of specialization and additional structures obscuring that fact from the casual observer. Moving even further forward on the timeline the same is true of its descendant, the epee du combat. When viewed from the side its deep cup guard becomes a thick cross and early versions with flatter guards bear an even stronger resemblance. It's possible but there was a huge philosophical movement about swirling around math and numbers during this era that's separate from the proportional design we're talking about. This is also when they started abandoning the traditional colorful and descriptive nouns used to name techniques like "ochs" or pflug" with high tech numbers like 5 and 3. As I said earlier I don't know circles and angles from anything and as you said it's much better to work with measurements directly from original swords than pictures so just for fun I'd like to encourage you to keep an eye out for longswords that are 3 parts blade, one part hilt with a cross 1/5 the length of the entire sword. Off the top of my head other numbers to watch for on 14th-16th c. central European swords would be 3,4,5,8,12, 17 as well as funny plays off these numbers like 3x8=24, etc. Oof, I scrolled right past them and missed them all completely.... thanks! I would like to second this thought. I too was wondering about where and how you will publish future and have published previous papers and how I would find access to them. It remains undecided in what format I will publish. Probably self publishing. Possibly a publishing house, but I think that is not likely. This would be a publication with a more popular approach, rather than academic, in an attempt to give a wider presentation of the subject (supported with *many* examples). To meet criteria for peer review I would divide the project into shorter articles and try to get them published in academic periodicals. I have been met with encouragement from some editors, so this seems like something within reach. There is a tendency for swords of Italian origin to not follow geometric principles in their proportions. We know that Italian architects were disdainful of the geometric rules that governed master masons north of the alps. Well, I definitely look forward to seeing more of your research in whatever format you ultimately settle on... I think it would be very interesting if you have been able to identify design trends in different times and regions. Thanks again for all the time you have put into this discussion! As I had suspected, I was submerged by work and travel until this morning and was forced to put this thread aside for a few weeks. I've just caught up with the very interesting concluding discussions. Just a quick thank you to Peter, and indeed to all of you, for your continued generosity in sharing your time, thoughts and experience, and for your ever friendly and respectful manner. They are greatly appreciated! Looking forward to new adventures soon. Kind regards and a lovely winter's end to all! Well, thanks to YOU, Anthony! Actually that was your step by step tutorial that made me take my ruler and compass to do some drawings. Before that I was just looking at all the interlaced geometric figures, trying to understand something. Now I think I have a far better comprehension of the thing, and I draw swords every week. And I'm seriously thinking about ordering swords fully designed by me for me, and not "just" museum replicas. This is a major step forward. Donc, merci beaucoup, et très bonne continuation ! Hey guys... Is this my first post? I think it might be! I'm a great fan of the geometric theory behind sword designs and also the graphing of dynamic handling in another 'parallel' thread, watching with great interest! I have past experience modelling in Solidworks, whose sketch function would allow something very controlled but it's massive overkill. I have less experience with pure vector graphics, so I'm sure there is a simpler tool, but I can't seem to find something which allows the correct degree of control over the shapes and lines. Welcome to the forum! Nice to find a new member from my home town. All the diagrams I have posted were created in Inkscape - I've found it quite easy to use, and it's available for free. I use Adobe Illustrator in my digital line drawings. Okay, I think I've got Inkscape under control enough... I have a submission for A457! I went for the simplest shapes I could find. I'm spotting weaknesses in my interpretation already, but I'm going to call it done. Centre of the pommel circle is the apex of equilateral triangle built from the lower guard line (this step I think is weak, being a "second-degree construction"?). The radius of the pommel intersects the diagonal arcs of the large square, and the first small circle.